These Asian-inspired packets of shrimp, bok choy and noodles are an easy, but special meal. You can use raw or cooked shrimp and the noodle of your choice. Makes 2. Double as needed. Preheat oven to 375 F. If making only two, leave rack in center of oven. If doubling to make four, place a rack in the top and bottom 1/3 of the oven and use two baking sheets, rotating their position half way through baking. Cook or soak noodles (enough for 2 servings), as per package instructions. Drain and allow to cool a bit. Tip: To quickly cook a small amount of noodles, boil a couple of inches of water in a large, deep skillet instead of a pot. It comes to a boil much more quickly and is enough water for a small amount of noodles. Meanwhile, prepare sauce by combining all the sauce ingredients in a small bowl and mixing well. Place shrimp in a medium bowl. Place bok choy in another medium bowl. Finally, place slightly cooled noodles in a 3rd medium bowl. Divide the sauce evenly between the 3 bowls and toss each to coat. Allow to sit while you prepare your parchment. Cut two 15x24-inch pieces of parchment paper. Fold each one in half to make 15x12-inch pieces. With the fold perpendicular to you and on the right side, use a pen to draw half a heart, starting from the bottom of the folded side, up and back to the folded edge 3 or 4 inches from the top. Repeat with the other sheet of parchment. Use scissors to cut along pen line and open up (the fold is the centre of your heart). Brush the inside with vegetable oil, leaving a couple inches around the outside bare. Prepare your packets by placing a pile of noodles on one side of the heart (in a line, close to the fold). Top with half of the bok choy and then half the shrimp. Repeat with the other parchment piece. Top each with the green onion, then divide any remaining sauce evenly over-top each pile. Seal up the packets - Fold the empty half of the heart to meet the other side evenly. starting at the top of the folded edge, start pleating and pinching and pressing down to seal, as you work your way around the edges. When you get to the bottom, twist the bottom point together. Place the packets on to a baking sheet (it's ok if twisted the end of the parchment hangs off). 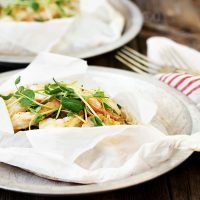 Bake for 12-15 minutes, depending on the size of your shrimp (longer for large shrimp). Packets should be a bit puffy. Open one slightly to make sure the shrimp are done (nice and pink). If not, re-seal and return to the oven for a few more minutes. To serve, make a slice with a sharp knife, then use kitchen scissors to cut a slit from top to bottom, and then small slits to each side in the middle so you can fold it open. Garnish with chopped cilantro, parsley or pea shoots. Serve with a lime slice for drizzling, if you like.